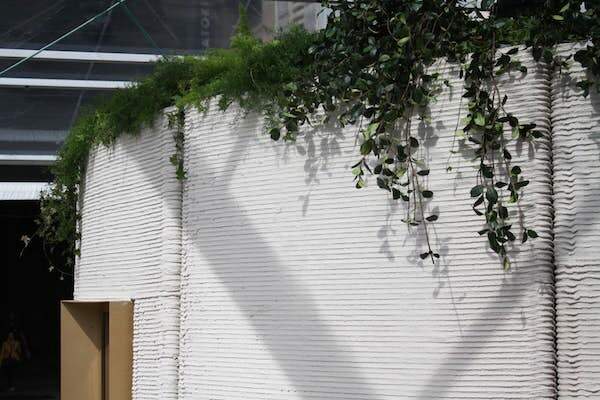 Recently a new 3D-printed house, the 3D Housing 05 project, was built on-site in the Piazza Cesare Beccaria in Milan as part of the Salone del Mobile Milano. 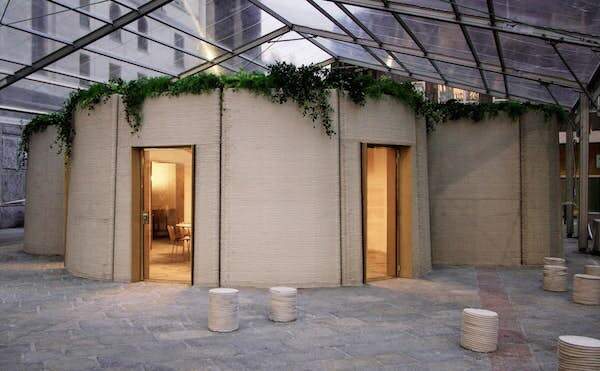 To create the innovative 3D-printed concrete house prototype, architect Massimiliano Locatelli of CLS Architetti collaborated with Italcementi Heidelberg Cement Group, Dutch construction company CyBe Construction, and Arup. The approximately 100m² structure took only around 48 hours to complete, but this time was spilt over the course of a week leading up to the event. The building was printed in 35 separate modules, which have now been taken apart and are being transported to Italcementi’s headquarters to be reassembled and displayed. 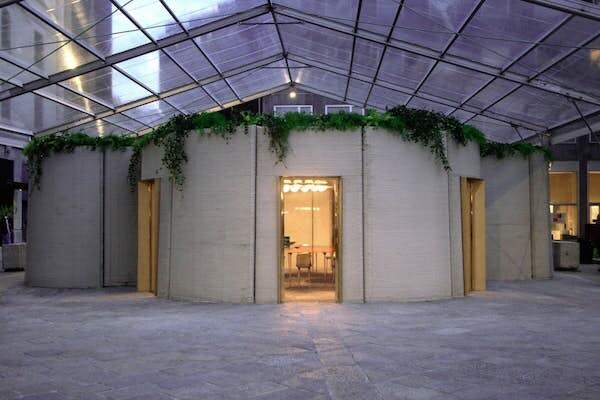 The grand idea for this project was to begin to show the world that with 3D-printing technology it is already possible to build a desirable 3D-printed house within a week. The new single-storey house has curved walls, a substantial living area, bedroom, kitchen, and an elegant bathroom. The kitchen area includes a kitchenette and a small dining area. 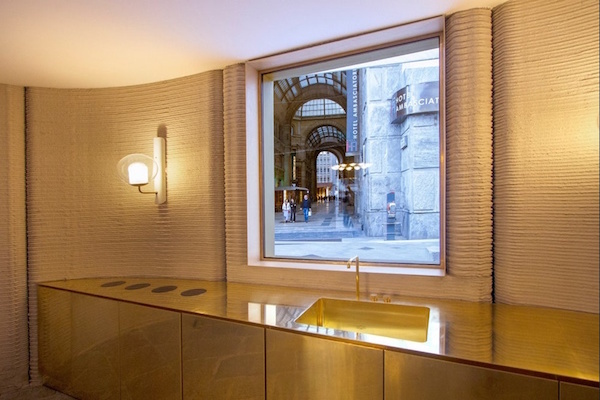 Unlike the very affordable ($US4000) 3D-printed house I wrote about recently, for this design event the interior was fitted out with high-end furniture and fittings, including brass window frames. 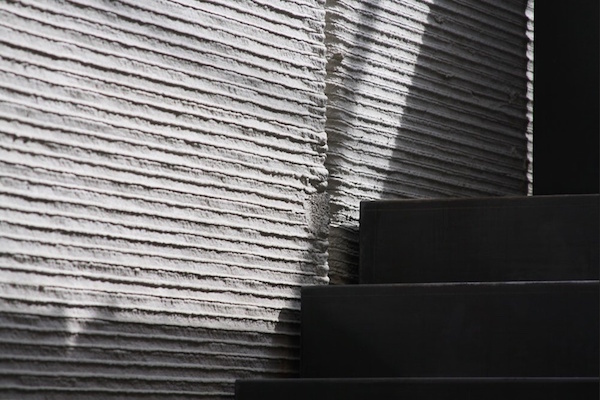 Like the previous 3D-printed housing project from New Story, to construct the building, a cement mixture was extruded from a nozzle in layers to build up the home’s walls, before the doors, windows and other finishing touches were installed by hand. However, a difference here is that 3D Housing 05 uses a 3D-construction printer that is a robotic arm mounted on a movable base, making for greater flexibility of movement during the 3D-printing process. View the short video below to see the printer in action. Like the New Story project, the 3D-printed concrete was left deliberately exposed. In this higher-end design project, the multi-layered concrete look provides a nice contrast with the sleek designer furniture and fittings inside. 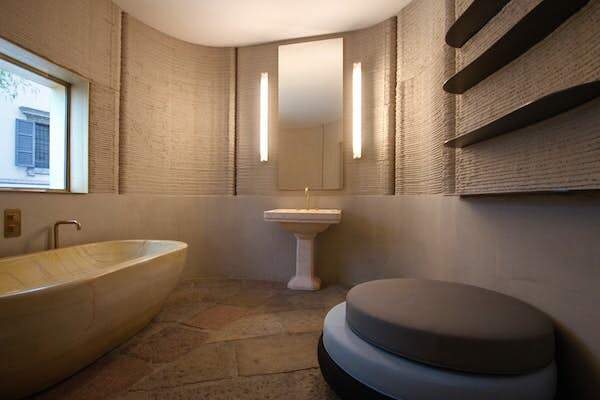 In a way, the look is quite similar to the rough, exposed concrete look some architects and builders achieve in more manual and time consuming ways. The look is the same on the exterior, although it is softened somewhat by the nice touch of the green roof: an overhanging rooftop garden. Rather than just being a temporary gimmick for the design festival, the people behind the project are planning for the future. The team is apparently working to develop the house further, with the aim of achieving well designed housing quickly and cost-effectively. Additionally, this kind of 3D-printed construction should allow for custom-made shapes that would not be able to be produced otherwise, or at least would be very expensive and inefficient to produce by other means. The 3D Housing 05 project won the Best Sustainability prize at this year’s design week. In terms of sustainability, the construction industry is one of the world’s largest C02 emitters and users or resources. 3D-printing technology could be crucial for making building more sustainable and efficient. One of the important aims of this type of construction is to reduce construction waste compared to conventional methods, and to allow materials to be repurposed and reused at the end of the life of the building. With this current building, the debris can be recycled and used as raw material for new 3D-printing constructions. Arup has been able to apply its previous experience with fully re-usable components. When the building is demolished in future years, the concrete can be pulverised and reconstructed with the same composite material, which is a mixture of cementitious powders, binders and aggregates originated from local sources. This is certainly an interesting new development in the fledgling 3d-print construction industry, and it’ll be interesting to see what happens next. I could see a time when the particular look and texture of 3D-printed construction becomes fashionable, as well as very affordable. In terms of design, it seems that curves will be much easier and less expensive to achieve than conventional construction, so that in itself could bring more variety to affordable housing in particular. I’ll be following new developments in this field with great interest. How to you like the house? Would you live in it yourself?